The exhibition presenting 20 photos from the cinematographic achievements of Werner Herzog focuses on showing similarity and inspiration between the paintings and director’s film language. The exhibition, taking the form of a multimedia installation, evokes a peculiar gallery, in which like in a dream, film frames appear, portraits of heroes – a subconscious projection of undefined areas of reality. This opens the field to seek answers to one of the most important questions asked by Herzog: who we actually are as people. Works of Werner Herzog are often referred to as a film “essay about a man”. Characters of his paintings are “changeling” and “madmen” mismatched to social norms, conventions and rules. Lonely, rebellious, rejecting the rules of social order, crossing borders, aiming to the limits of their own abilities – in their existential entanglement they express the only possible way to reach the inner truth about all of us. The specificity of the realism of the Herzog’s painting serves to show the interior of what is hidden, pulsating under the surface. The influences of the aesthetics and thoughts of romanticism, existentialism and expressionism present in his work – noticed and invoked by critics and researchers – do not exhaust both the field of references and interpretative readings. As Joanna Sarbiewska notes in her book „Ontologia i estetyka filmowych obrazów Wernera Herzoga”(Ontology and aesthetics of Werner Herzog’s film portrayals), Herzog’s uniqueness lies primarily in the reference power of the film, which records existensial (silent, hidden) presence – unavailable to other cognitive tools. Although Herzog “believes in celluloid tape,” his films are rooted in the tradition of art. 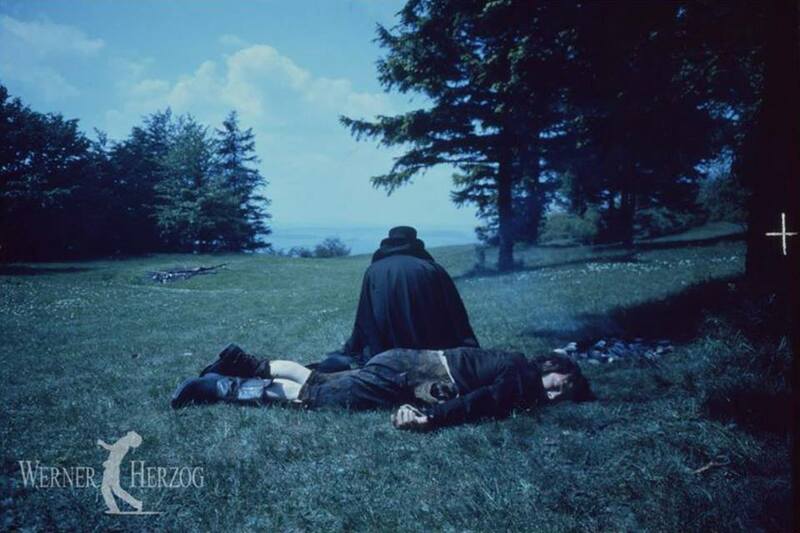 The specificity of Herzog’s film language is partially formed by the similarities of his works with painting, recalling not only the work of the representatives of Romanticism or Expressionism, but also of the Baroque or the late Middle Ages. As the director often says in the interviews, painting has had an incomparably greater impact on his work than any cinematographic work. Inspirations and influences, however, go beyond mere formalities, compositional, iconic quotations. They concern much deeper areas of feeling, raised in hermeneutic analyzes of painting. As Leszek Kołakowski writes in Horror metaphysicus, various aspects of the ultimate reality (what is nameless and indescribable) are best expressed in religion and art. An intense act of artistic experience opens up a sense of understanding, a kind of fleeting fulfillment that is both valid in the cognitive sense and provides the conviction that one is in contact with something more real than everyday reality. OKO Prologue is an introduction to the International Non-Accidental Meetings “AN EYE NEVER SLEEPS”, which will take place from 01/07/2018 – 04/07/2018 in the Ostromecko Palace.